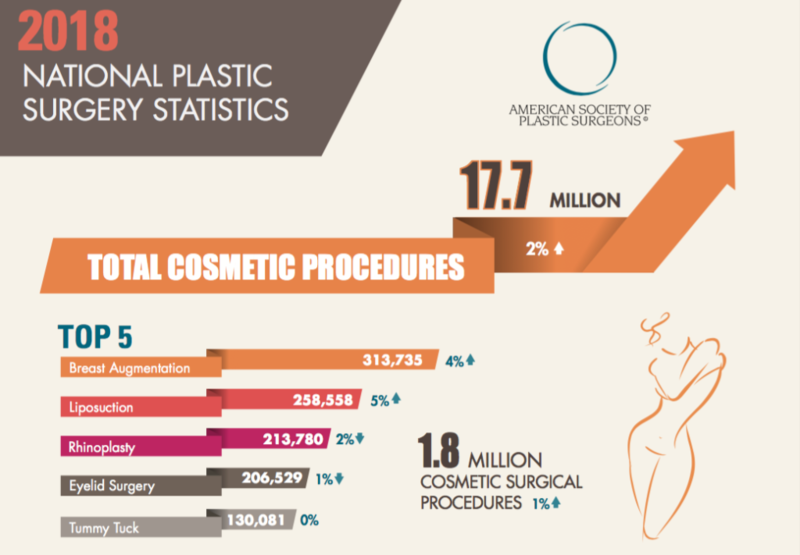 The ASPS 2018 Plastic Surgery Statistics were released this week, and they are trending up. The American Society of Plastic Surgery has released the 2018 National Plastic Surgery Statistics. The Top 10 Cosmetic Plastic Surgery Procedures maintained their order of popularity, with the overall trend being up compared to the previous year. Below, I have listed the most popular procedures and the percentage change from the previous year. The 2018 Top 5 Cosmetic Procedures reflect the overall upward trend. The 2018 Top 5 Minimally Invasive Procedures also show growth. The top 10 procedures have been pretty consistent through the years, but four procedures stand out for the large percentage changes when compared to last year. I am not a fan of either of these procedures, because in general, the results are not great. Moreover, with advancements in fat grafting to the buttocks, the cosmetic results for Buttocks Augmentation have improved tremendously. Unfortunately, it is still not possible to do fat grafting unless the patient has enough fat to move. Both these procedures owe their rise in popularity to improvement in the technology surrounding them. Fat grafting has evolved from stuffing the buttocks to shaping the buttocks. Gentle handling of the harvested fat, and meticulous care in placing the fat have improved both results and safety. For hair transplantation, improvements in harvesting hairs and minimizing donor site scars have made the procedure more palatable for more men and women. It’s important to remember that Cosmetic Surgery is still surgery. Popularity and trends certainly influence behavior, but as a patient, you still need to do your homework. The Internet provides a wealth of information, but the emphasis is too often quantity over quality and new over proven. While it is nice to gather generic information anonymously, Cosmetic Surgery is neither generic nor anonymous. Don’t do it on your own. If you have friends or family who have been through it, ask them. Seek professional advice from experienced, board certified plastic surgeons. The information necessary to make an informed decision should always be specific to your needs.